Posted by FormSmarts on May 5, 2009 at 5:12 pm in form builder. You need a FormSmarts Pro account to use Paypal Integration. Just wanted to make this clear, because although the post is tagged “pro”, it’s not explicitly written anywhere. A user emailed us asking whether she would need to disclose her Paypal details to FormSmarts in order to use Paypal integration. We want to make it very clear that you do NOT need to disclose your Paypal password in order to use Paypal integration. We will NEVER ask you to reveal your Paypal password. The only information FormSmarts needs to know is your Paypal login (email address). Well, it’s nice to know I need “pro” to integrate Paypal after trying to make it work four times ;-) That’s the main reason I came. But I’m doing a public service site and already taking a loss so it would be nice to try this out and make sure it works the way I need it to before I spring for fifty bucks. I’m sorry if we didn’t make it clear that this was a Pro feature. I’ve switched your account to Pro-test mode so you are able to test Paypal integration with your form. If you have any questions, feel free to use the live Ask FormSmarts box. The forms are very good and paypal works really well! Any idea when you will be able to add Google checkout support? We haven’t got a release date yet, but next version of FormSmarts Payment Integration will include Google Checkout. Subscribe to our Twitter/Facebook feed for updates. I want to use Paypal integration for prospective members to 1) tell us about themselves and 2) donate the annual membership fee. The problem is that the site visitor would not be choosing from multiple choices, so a pulldown list or a radio box will not work for this (Formsmarts is enforcing a rule that a radio box must have at least two options). Right now, I have faked that by having a radio box with two choices: one year membership donation or two. The problem is that the PTSA does not want to ask for two year’s worth of donation. We need the equivalent of Paypal’s “Donate” button (with fixed dollar amount). Simply contact FormSmarts Support asking that we manually remove the unwanted radio button. So, this is cool, if i can build a form that not only passes the info on to paypal, but sends me an email with ALL the requested info (even the fields that PayPal does NOT need). Can this be done? Yes Todd, we pass on to PayPal the information they need to process the payment, such as product details & quantity, customer email and name if available (as you would expect with a shopping cart), while also sending you all the request information. You can get form data both by email and as a downloadable Excel report. Can that be done? Also those payment can vary based on options they choose. This falls into the nothing is ever easy category. Many of our customers who use FormSmarts to power an event registration form initially sell early-bird registrations at a lower price, then at some date change the registration fee to a regular price. It doesn’t provide much additional customer value for us to automate a process that is only ever going to happen once (twice in your case): just log on to FormSmarts the days when prices need to be changed and update them manually (or ask your customer to do so). FormSmarts forms are dynamic content, so any change you make in your account will show immediately on your website. There is no need to re-publsh the embed code. Regarding your second question, you can include as many chargeable items (i.e. priced options) as you need. All selected options will be added up on the payment page on Paypal. If registrants have to pay twice, I would recommend creating another form for the second payment. Wow! I am very impressed with your quick reply. Then, have all donations (fixed and discretionary, if any) passed on to Paypal. The key here is that the *user* enters the dollar amount for the discretionary donations. Is there any way to do this? Do I need to have a PayPal account set up before setting this up? You don’t need to have a PayPal account before setting this up, but you will eventually need to create one to receive payments. See “Get a FormSmarts Pro Account Free!” above to find out the advantage of creating this account via this link. In order to integrate PayPal with a form, I need to use the PayPal account’s email address as my FormSmarts Login. Is there any way to create another form with a different PayPal account while the first form is still active? For security reasons, you can only link a FormSmarts account to one PayPal account. This is simply because money is involved and whoever controls the FormSmarts account can change every form in it. I also have a customer that needs forms for event registration, and as I have read in the posts it is possible to make and integrate with PayPal, I am willing to use your platform, but my main concern is if as a Web Developer with different customers, will I be able to different forms integrated with different paypal accounts with the same FormSmarts Pro account? Or will I have to open a different account for every customer? I tried to open a PRO account for a customer yesterday which for some reason I couldn’t so I guessed signing up for the FREE account first and the upgrading would be the solution? The problem is that my customer isn’t getting the Confirmation email so we can sign in to the account and do the upgrade… We have double checked all of your recommendations and still not getting confirmation email. I don’t want to put the email address of the account here… But the extension is @mail.com (not very common, so I think it would be easy for you guys to find in your records. My customer’s name is Manny. I see your reply to Dustin above. My issue is that I create websites for a number of local charities and community organisations, each of whom has their own PayPal account. From what I am reading here, all of their various payments HAVE to come to my PayPal account as I have the FormSmarts account. Is that correct? If so, any plans to change this please? Otherwise I have to pay for multiple copies of FormSmarts under different login IDs. Because money is involved and for security reasons, you may only receive payments to the PayPal account matching your FormSmarts account’s login email address. Each organization you’re creating PayPal forms for should have their own FormSmarts account, in the same way they need to have their own PayPal account. I set up a “membership” page for a local charity.. but I have noticed that PayPal is adding a £4.99pp Post and Packing fee that is not mentioned anywhere on my Form. Can you advise where PayPal is picking this up from? You must have set a P&P rule in your PayPal account. The rule will then be applied to all payments you receive via PayPal. Re. the previous post, you were right, the charity I have created the website for also have an online shop where they have applied PayPal P&P rules. It seems that for their “add to cart” buttons there is some HTML code that can be applied to over-ride these rules.. but my FormSmarts form does not use such buttons. Is there a way that your generated forms can over-ride a PayPal profile setting for VAT and P&P..? No, I’m afraid you can’t override VAT or P&P preferences at this time. I inserted a donate button on my website and i have a basic paypal account, not business or premium, will it still work? Yes, however people will only be able to donate using an existing PayPal account, they won’t be able to use their credit or debit card. That’s obviously a serious limitation. I am creating a registration form for a fun run and would like to offer a discount if a participant belongs to a certain club. If they check the box, their total would be reduced by a fixed amount. How do I go about implementing this? The syntax for discounts on FormSmarts is a negative price, i.e. 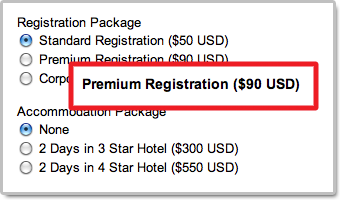 “Club Member Discount (-$10 USD)”, like the ‘Early bird discount’ on this registration form demo. What is the dollar limit? Is there special characterization for entering amounts greater than $999? Matt, amounts are not limited to $999. What type of payment (general payment, donation, subscription form) are you talking about? Please let me know the URL of your form (e.g. f8s.co/lqh) so I can help you further. Got it… I changed “Brick & Mortar” to “Brick and Mortar” and it works!! Matt, you will also need to remove the comma separating the thousands. Note that for any amount greater than $1000, you should really use advanced paypal integration (included with all Business accounts). The 10k option won’t work with standard integration. Also, because PayPal won’t allow you to mix up donations and regular payments, you should create a separate donation form and add a link to it on your form http://f8s.co/111q. This will allow someone to purchase a $1000 Builder sponsorship and also donate $500. Is it possible to offer % discounts? I’d like to offer 10% discount to seniors. How can I enter that discount option? Mandi, FormSmarts only supports fixed discounts at this time. The syntax is , see this registration form demo. The syntax is My Discount (-$10 USD). Hey – If I buy the “PRO” account – can I create a “make this a reoccurring donation” an option on my donations form that is integrated with my PAYPAL account? Hi, I am desperately trying to find a form builder that will allow me to limit the amount of payments made. Can yours do this? Hi Deanna, please see our response to your message on our Facebook page. Hi Jacy, do you mean limit the amount of payments made for each transaction? or the the amount of payments received during the lifetime of the form? anything above the “Brick and Mortar” level does not forward the form to paypal, is there a limit?? Hi, is it possible to create a form with PayPal payment where the user has the choice between paying a one time fixed amount or spreading that payment over a year? Hi Cal, yes, it is possible to have to payment options, one fix amount as discussed on this page and a payment in installments over a year. Hi – I am working on forms for a goat registry. Members have to fill out a separate form for each goat. I have the paypal info working for a single form. But, if they want to register more than one goat – they end up having to pay for each form each time. What is your suggestion for a member to fill out more than one form and pay for all at the same time? Nicki, SuperCart allows a member to submit several forms and pay for all registrations at the same time. Can the member have a choice to register by credit card or payment on site the day of the event? Carl, there are two ways to allow members to register for an event and either pay online or ‎on-site. First you can design the form so that registration fees and any other priced options are ‎not mandatory by providing for each one an alternative on-site payment option. If there are no fee to be charged online on a form, FormSmarts will send it to you straight away. Note however that the registrant won’t get a confirmation email. Second, you can provide a separate form for members who want to pay on-site. Once you’ve created the first registration form‎, make a copy of it and set it to “Show summary page with email & PDF receipt”. This will allow members to register online, then print the confirmation page or get a PDF receipt or confirmation email and bring it along on the day. All receipts have a QR code you can scan on the day to access the registration online and, for example record that the person has paid.